It is a mid-Monday morning in June as I wind my way through the rolling pastoral hills outside Petaluma on Chileno Valley Road. The air is already heavy with summer heat, perfuming the drive with the scent of eucalyptus and sage that lines this country road. The grasses in the fields are golden, dried almost overnight as the spring greens yield to the warm breath of the sun. I am on my way to meet Donna Pacheco. She and her husband Jim are the driving force behind Achadinha Cheese Company; a small family farmstead that produces superb handmade artisan goat and cow’s milk cheeses. For nearly 13 years, Pacheco has been honing her craft and garnering awards along the way. The farm’s signature cheese, “Capricious,” named for the unpredictable moves of frolicking goats, won Best Cheese at the national American Cheese Society competition in 2002. Demand for their products has steadily increased since, as has the company’s presence at local farmers’ markets; seventy-four markets, to be exact, throughout the Bay Area. My GPS signals I have arrived as I turn up the dusty dirt driveway leading to Pacheco Ranch, a 230 acre spread that supports the 600 goats and 24 Jersey cows whose milk is the foundation of the cheese making operation. This ranch, originally established in the 1800’s, was purchased by Donna’s father-in-law in 1969 and operated as a dairy until 1997 when the Pacheco’s switched to goats and started making cheese. Donna’s husband Jim was raised on the property and is a third-generation dairyman on both sides of his family. The couple took over the business when they married in 1990, and, along with their four children, continue the proud family farming tradition. The name “Achadinha” (pronounced osh-a-deen-a) pays tribute to a small town in Portugal of the same name, where Pacheco’s father-in-law is from. His cousins in the next village hand milked cows and made cheese in the old tradition, providing inspiration for this modern-day extension of the family business. The ranch house, barn, and out-buildings sit on a knoll at the end of the road, perched overlooking the surrounding pastureland and three ponds. I park and make my way across the yard toward the cheese barn, noting the shapes of distant cattle gathered under some trees to escape the heat, and the sounds of bleating goats nearby. Donna is expecting me. She’s been up since 5:00AM and it’s already been a busy morning. She bustles out with greetings, dressed comfortably for cheese making, her chestnut hair pulled back in a loose bun tucked under a protective net. She beckons me inside with an apology as she darts to the side to monitor a thermometer and make careful notes. Today she is making her biggest batch of cheese in a year; processing 1,000 gallons of freshly pasteurized goat milk to produce their four signature artisan cheeses. A large stainless steel cooking table nearby is already brimming with milk which is cooling. Soon cultures and rennet will be added to begin the solidification process. The resulting curds will be stirred and “cut” into 1″ cubes with wire frames, then pressed into porous molds that allow the liquid whey to drain off. The unmolded cheese wheels will be dry salted and placed in the aging room to rest flat for 30 days. At that time they receive a brine scrub and the first of ten olive oil applications before being placed upright to age on cypress wood for one to twelve months, depending on the cheese. As they age, the wheels are individually hand rolled to press out remaining whey, then pressed again using Pacheco’s “high-tech” system of milk crates, boards, and buckets of water to squeeze out excess moisture. A wheel of cheese weighs in around 15 pounds at the outset, finishing around 11 pounds after aging. When asked how much cheese she is able to produce, Pacheco smiles. “That all depends on the time of year and what the girls give us,” she answers, “and they are consistently inconsistent!” In winter when the grass is green the goats produce more milk with a higher milk-fat content. “You can actually taste the sweet grass flavor in the curds,” Donna comments. In summer, when pastures are dry and milk production goes down, Pacheco supplements the goat’s diet with a little alfalfa and brewer’s grain–a bi-product of beer production from barley and hops sourced from three local brewers. The fermented grain is actually good for the goat’s stomach, and increases the butterfat in their milk. It also imparts a unique flavor to the finished cheese. On average, the farmstead produces around 7,000 pounds of cheese per month. Donna leads me down a corridor to the aging room. We step inside the temperature controlled space lined with floor to ceiling rows of cypress wood racks filled with wheels of cheese in various stages of aging. 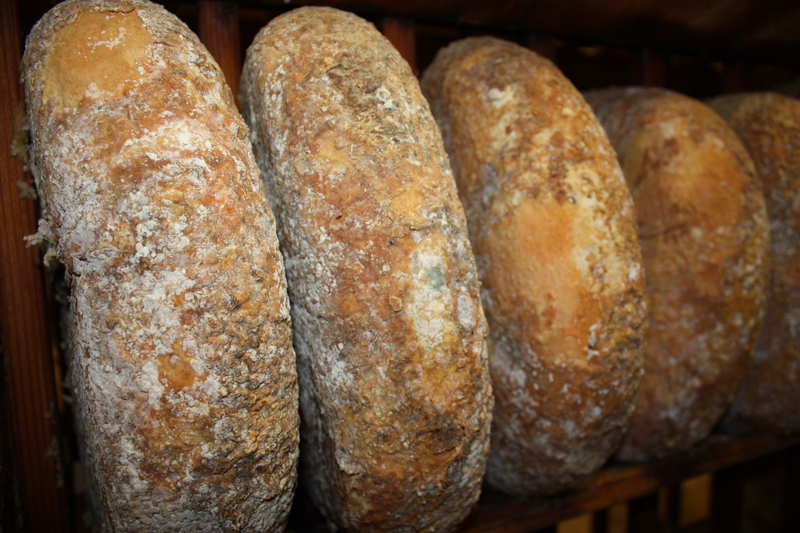 The distinct aroma of curing cheese floods my senses: tangy, pungent, mold and olive oil mingling together The visual is stunning as well: row upon row of large upright cheese wheels, varied in rind color from butter-cream yellow to a deep burnt sienna mottled with grey-green mold growth. To learn her craft, she attended local cheese conferences and questioned other cheese makers about the fine points of the process. She also reached out to high school friend Howard Bunce, master cheese maker at the Marin French Cheese Company in Petaluma, who became her mentor. “He knew the science of making cheese,” she tells me, “and would take my calls at all hours.” Inspiration also came from Wisconsin based cheese maker David Potter, from whom she still purchases the cultures for her cheese. “Would you like to meet the girls?” Donna inquires as we leave the aging room. 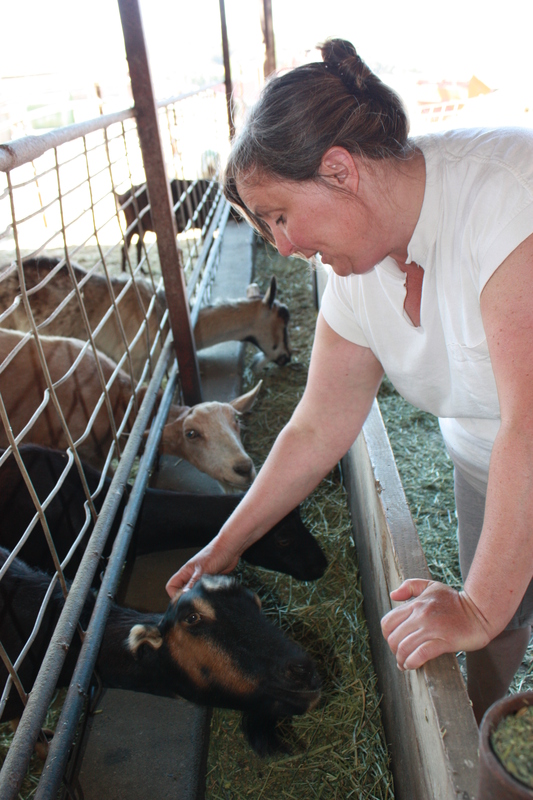 Her fondness for the goats is implicit in the way she refers to them, like a mother talking about her daughters. Taking a momentary break from her vigil, she takes me on a tour; stopping first at the milking room where each day begins with the morning milking at 7:00AM and ends with the evening milking at 6:00PM. Modern machinery now thankfully replaces what used to involve hours of labor intensive milking by hand. We continue wandering toward the enormous goat barn, accompanied by “Jackie”–one of five resident Australian Shepherd working dogs that help keep the herd in line. I can hear the “girls” before I see them; the silhouettes of seemingly endless animals escaping the heat in the shade of the expansive structure. The barn is open to the field, and the goats may roam free range to their heart’s desire. Although the operation is not certified organic, the pastures are pesticide-free and no hormones or antibiotics are given to the animals. We duck inside, and the goats, more curious than cautious, come to see what’s up. There are six breeds of dairy goats in all: Alpine, the earless LaMancha, Saanen, Oberhasli, Toggenburg, and Nubien, the prima donnas of the barn whose milk is naturally higher in butterfat. The goats will average an 18 year life span on the ranch, giving birth to one baby in their first year. After that, 90% will birth multiples annually with some having up to five kids at one time! Donna leans over the rail, affectionately scratching one persistent animal who is vying for her attention with several others. Admiration clearly runs both ways on the ranch. My attention is pulled toward a new sound–a tiny voice amid the adult bleating. A newborn kid lies nestled against its mother, the next in a long line of dairy goats who will continue to bring distinction to this ranch and its cheese maker. “We are working hard to create a sustainable, profitable operation that we can pass on to our children one day,” Donna comments with conviction. I have no doubt she will succeed. Currently, Achadinha Cheese Company produces four artisan cheeses: a goat’s milk feta brined in sea-salt; a fresh curd blended from goat and cow milk; “Broncha” a mold-ripened goat and cow milk blend table cheese great for nibbling or cooking; and “Capricious,” the company’s signature hard aged grating cheese, big on flavor. It was named one of Saveur’s “Fifty Favorite Cheeses in the United States” in 2005, and continues to be a customer favorite. *Tuesday: Novato Farmers’ Market, Downtown Grant Avenue, 4:00-8:00PM through September; Tam Valley Farmers’ Market, Shoreline Shopping Center at Tam Junction in Mill Valley, 3:00-7:00PM, May-October. *Wednesday: Corte Madera Farmers’ Market at Town Center Mall, 12:00-5:00PM year round. *Thursday: Marin County Farmers’ Market at Veterans’ Memorial Auditorium parking lot, 8:00AM-1:00PM year round. Ross Valley Farmers’ Market, Downtown Ross Commons, 3:00-7:00PM, May-October. *Friday: Mill Valley Farmers’ Market, Alto Shopping Center, 9:30AM-2:30PM, year round. Sonoma County Cider Week: Celebrating like Spaniards at TXOTX!! Though the cheese is not labeled “organic”, as described in your article it sounds as though it is technically organic? What keeps it from being branded as “organic”? Like many small producers, Mike, Achadinha has not gone through the expensive and lengthey process of becoming certified organic. Their fields, however, are naturally fertilized with goat/cow manure and never treated with chemicals–so the animals free-range on natural grass. They also do not give their animals antibiotics or hormones.